With this bleak budget outlook and the reality that 19 new AsCans are now in training at NASA, CSA, ESA, and JAXA, the space agencies are not likely to be taking any additional recruits in the foreseeable future. What does this mean for Astronaut Hopefuls (AsHos) like you and me? First, let's review the report. What should be the future of the Space Shuttle? The Committee determined that after the Shuttle is retired sometime in 2011, the gap in American human launch capability will be at least seven years. Seven years! There has never been a gap that long since the human space program began. They made a vague reference to "recertification" of the Shuttles to keep them operational longer but did not expand upon the idea. It looks like NASA astronauts will be hitching rides on Russian or other vehicles for a long time to come. Does this mean NASA won't need pilot astronauts for several years? What should be the future of the International Space Station (ISS)? No surprises here. Instead of deorbiting the station in 2015, the Committee recommends keeping the ISS fully operational until 2020 to give the U.S. and its international partners time to get a return on their investment. After all, it's taken 25 years and $100 billion to build the massive structure. The Committee was careful to emphasize that not extending ISS operation "would significantly impair U.S. ability to develop and lead future international spaceflight partnerships." In other words, if we mess this up, our leadership role in space will be compromised. The ISS could serve as a springboard to future international collaborations in space or otherwise if it's leveraged properly. One way to keep it going longer, perhaps significantly beyond 2020, is to commercialize the ISS. There is precedent for this. For example, the NSF contracts operation of McMurdo Station in Antarctica to Raytheon Polar Services. Does this mean scientist astronauts (commercial or otherwise) whose experiments can be carried out on the ISS will be the main type of astronaut for the foreseeable future? On what should the next heavy-lift launch vehicle be based? 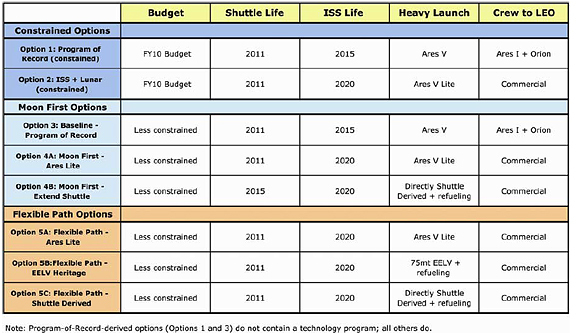 The Constellation Program's reliance on wedge funding depends on the retirement of the Shuttle in 2010 and abandonment of the ISS by 2016 to have the funds necessary to build the Ares launch vehicle, Orion capsule, and Altair lunar lander. The Committee determined that given schedule delays, the Ares I and Orion will not be finished in time to reach the ISS before its currently planned termination. They prefer the Ares V Lite (aka: Ares IV?) combined launch vehicle instead of separate Ares I and V launchers. I think it's really cool that they cited on-orbit refueling as a possible way to offset costs while also stimulating the commercial launch industry. Interestingly, I saw no mention of the Direct Launcher (formerly Direct 2.0) in their report and wonder if they even considered it. Former NASA Administrator Mike Griffin is not happy with the Committee throwing his Ares plans out the window, but he has a lot to answer for with perhaps overestimating how well the Constellation program was adhering to cost and schedule estimates. He's slotted to testify before Congress next week (look for details here). Several members of Congress are already reacting to the Augustine Report. Perhaps pilot and flight crew opportunities for astronauts on commercial craft will start to materialize. How should crews be carried to low-Earth orbit? This would have the additional benefit of focusing NASA on a more challenging role ... developing cutting-edge technologies and concepts, ... overseeing the development and operation of exploration systems ... beyond low-Earth orbit. In other words, NASA must get back into the business of developing new technologies to enable the strategic exploration of space for decades to come and leave routine operations to someone else. Assuming NASA gets more funding to continue the push beyond LEO, does this mean astronauts too can focus their training for exploration beyond LEO? What is the most practicable strategy for exploration beyond low-Earth orbit? Mars first, with a Mars landing, perhaps after a brief test of equipment and procedures on the Moon. Moon first, with lunar surface exploration focused on developing the capability to explore Mars. Flexible path to inner solar system locations, such as lunar orbit, Lagrange points, near-Earth objects and the moons of Mars, followed by exploration of the lunar surface and/or Martian surface. A human landing followed by an extended human presence on Mars stands prominently above all other opportunities for exploration. Mars is unquestionably the most scientifically interesting destination in the inner solar system ... If humans are ever to live for long periods on another planetary surface, it is likely to be on Mars. Mars is the ultimate destination for human exploration; but it is not the best first destination. Both visiting the Moon First and following the Flexible Path are viable exploration strategies. I guess Robert Zubrin's inspiring August 5 testimony didn't sway them into favoring a Mars first option. Zubrin later criticized their budget estimates as being way too high. According to him, rather than spending 12 years and $14-20 billion per year ($168-240 billion total) on the Ares program (which is what the Augustine Committee's proposed $3 billion increase would allow), NASA should instead have a RFP offering up to $5 billion for the commercial development of an heavy launch vehicle within 5 years. Such a dramatic idea was apparently not given serious consideration by the conservative Augustine Commission. The Summary Report ignores Mars as a budgetary scenario and only considers the Moon and Flexible Path alternatives with different technology development scenarios. That's how they came up with the $3 billion per year extra recommendation to keep an exploration program afloat. I'm not opposed to exploring the Moon at all, but I don't like to see Mars relegated to the category of "someday" without serious consideration. The Committee feels that exploring the Moon will allow us to "develop the operational skills and technology for landing on, launching from and working on a planetary surface ... that will one day allow us to go to Mars." Yes, it will. Whether that's necessary in order go to to Mars is a matter for debate. Either way, we need to explore the Moon in its own right, and it's the perfect place to gain a foothold as a space-faring species. The Flexible Path alternative is interesting because it includes traveling to Lagrange points, near-Earth objects, lunar and martian orbit, and landing on a moon of Mars. It emphasizes humans working along with robotic probes on small planetary surfaces to achieve a series of "firsts" to help keep the momentum of space exploration going. It doesn't exclude humans going to the surface of the Moon or Mars either. I'm happy for this recommendation to NASA to expand its scope beyond a narrow Moon-only focus for human space exploration. What is the timeline? Will any of the current astronaut corps get to travel to the Moon, Mars, an asteroid, or a Lagrange point? What about those of us AsHos "on deck" who will be join/replace them in the coming decade? It comes down to this: Either NASA gets more money allowing U.S. human space exploration to expand beyond LEO, or it doesn't. We've spent $517 billion bailing out failed industries, $790 billion in Iraq, and countless more on other wasteful government programs. The U.S. spends a staggering $2 billion per week in Iraq alone! Surely a measly $3 billion per year can be found somewhere to shore up NASA's shortfall. We need to be investing in science and technology to spur job growth, improve education, and regain American competitiveness on the world stage. That's the kind of change Obama supposedly represents. I hope he steps up to the plate and delivers. When will astronauts next put bootprints on another planetary body? We're at a crossroads in space exploration. Given the country's problematic economic situation and focus on other issues like health care, can we really expect space to get the attention it deserves? After all, the Augustine Commission report hasn't really garnered much mainstream media attention yet. Perhaps NASA won't get a funding increase and will be forced to scrap the Constellation program, setting us back years. However, if NASA administrators, Congress, and the President take the Augustine Commission report recommendations to heart, we could see the birth of a truly new era of human spaceflight. We'll establish a base on the Moon, visit Mars, and start learning how to really live and work beyond Earth. The demand for talented people will spur an Apollo-like bump to our economy and create opportunities for astronaut hopefuls to join in the fun. I'll see you there. What does this mean for the AsHo group? Well to me, it means that we are looking at least a 5 year gap until the next selection and probably longer. With the ramp up of commercial industry it may be fair to say that the best chance for people in this group is with the private sector, but will probably be more in the realm of pilots and flight crew rather than scientist types. This will be especially true if the operational lifetime of the ISS is not extended, or if adequate funding isn't allocated to allow the new National Laboratory to reach full and productive capacity. With everything that's on the country's plate right now it’s hard to see that space exploration will get the necessary boost in funding if it’s not lucky enough to be able to keep at current levels. Given how shuttle launches barely make the news anymore, and you sure as heck don't see any coverage of ISS Crew launches from Russia, unless we find something to ignite the country's interest in space science this is going to be a very tough job even for the commercial sector. Does this mean that I'm going to give up [trying to become an astronaut], heck no. ... We need to be a leading voice in why this is important both for our country and for our species as a whole. What do you think? What is the outlook for astronaut hopefuls in the next 5-10 years? 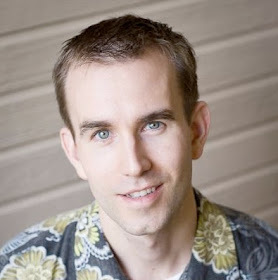 An excellent post and summary Brian, bravo!! Thanks again for including my comments as well. I too was surprised by the dismissal of the Commission of Mars as a viable near term goal since their job was to consider all options. Maybe the full report will address why this wasn't a viable first destination. Whole hardily agree on your budgetary summary; that was one of the most frustrating things about the Bush Administration's empty support of NASA by giving it lofty goals but no funding. It will be interesting to see what if any reaction that this commission gets out of Congress/current administration. Despite the high cost of this commission, I think it should be a once a decade thing to make sure that we are indeed on the right track and have a viable/realistic plan for achieving our stated goals and objectives. The outlook for the next 5-10 years is the same as it is today: Out of the thousands that apply, we seek to be one of the very few chosen. It'll always be "Go" or "No Go" for us -- whether the next class is 10 or 1000 -- and for every time it's "No Go", we strive to work even harder for the next attempt. Admittedly, there will be a lesser need for astronauts since the next program will not be sending 6-7 astronauts up every few months, but in no way will that change our ambitions to become one. 1. It's closer. Communications are faster, resupply will be more available, and the cost of delivery will be much lower than sending stuff to mars. 2. Explorers on the moon won't be as deep in a gravity well as they would be on mars. Bringing things back home will be much easier. I feel that this will be an important factor, as it will lend itself to commercial exploitation of minerals (helium-3, anybody?) or anything else we find. 3. 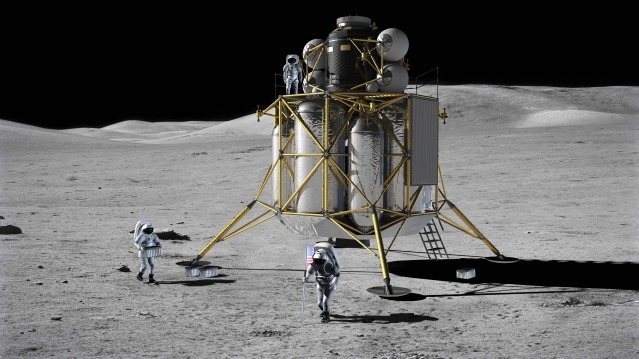 Establishing a base on the moon will be easier and will involve fewer engineering challenges. I've read that construction on mars will have to deal with things such as shifting ground, dust on solar panels, and extensive peroxides capable of corroding composites (and flesh). 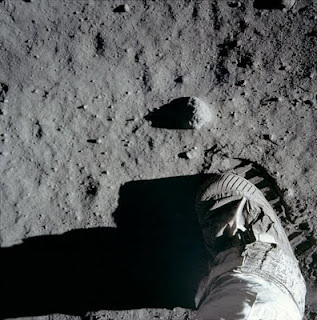 On the moon, the main challenge is the gritty dust that clings to things. Sandblasting from rocket exhaust is a secondary problem. 4. Once the moon base is constructed, it would serve as an ideal base for exploring the rest of the solar system, as it's close enough to earth (see resupply) to serve as a waystation for further missions. I see future missions as originating on the moon, and returning to the moon, not earth. Mars is a little far away to serve as a launching platform for further missions. Asteroid mining is also something that could be a worthy goal, but I think it would best support a moon base rather than directly returning minerals to earth (delta-V issues).